The final meeting for 2014 of the Chicago Food Swap took place this past Sunday at Peterson Garden Project‘s Fearless Food Kitchen in the Broadway Armory Field House. Despite freezing temperatures, snow flurries and parking woes, the event was a tremendous success. Everyone left laden down with delicious homemade and homegrown food and a warm feeling of fellowship and community. Every year at this time, the Chicago Food Swap is visited by the Squash Fairy, otherwise known as Jim Evans from Ready Jam Farms, an organic vegetable farm located in Marengo, IL. 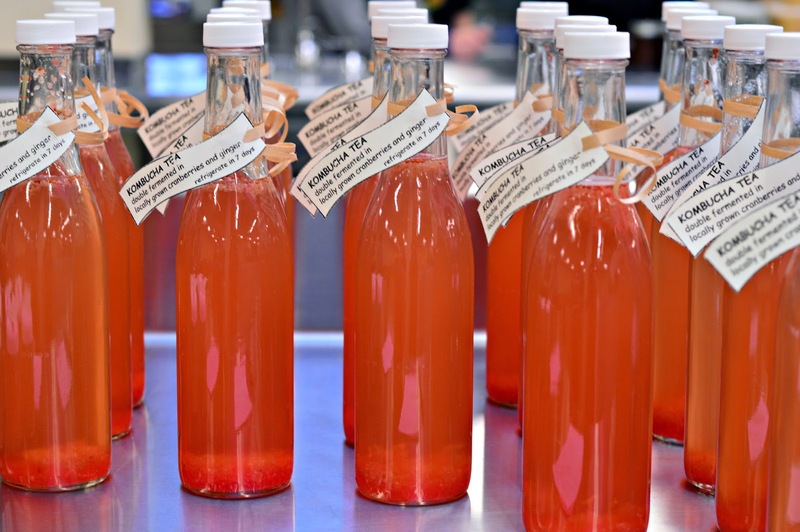 For the past three years, at the end of the harvest season, Farmer Jim brings boxes of winter squash and pumpkins to the Chicago Food Swap and is remarkably game about swapping them for anything and everything on offer, from kombucha to quince paste. The swappers who were able to score some squash — and that was just about everyone — felt like they had won the food swap lottery. It being November, and an especially cold November at that, soup was a very popular swap item this month. I think I made a point of trading for every soup that was on offer and am now set for lunch for a week! I came home with Patty’s cauliflower soup, packaged adorably with croutons, Nancy’s White Bean and Swiss Chard Soup, Pamela’s Arroz Caldo (Filipino Chicken Rice Porridge), Leah’s Cowboy Beans made with barbecued brisket, and Middle Eastern Lentil and Rice Soup from a swapper that I cannot remember. Soup makes a terrific swap item because it is easy and relatively inexpensive to make in large quantities and it travels well in a pint jar or plastic container. Plus, people really enjoy trading for soup because it makes a delightful lunch or dinner in the days following the swap. Also on the savory side were Cathy’s dumplings and Thai-style curry, black bean dip from Jill and Liz’s beet-apple salad. Of course, it would not be a food swap without delicious baked goods! Baker extraordinare Sandy brought pieces of apple slice, which is like apple pie for a crowd, and I just had to score some for my husband. I also saw apple bread, apple turnovers, apple chips and mini apple pies. Tis the season for apple! New swapper Desiree made two different kinds of seasonal cupcakes, at least one was pumpkin, and those were very popular. Sisters Melisa and Jules are notorious for their outrageous baked goods like sticky toffee pudding and chocolate chip banana bread and they brought it all this month. Longtime swappers Gail and Diane brought gluten-free buns that taste like scrumptious, eggy popovers. With buns like that, who needs wheat? New swapper Colleen brought her family’s famous kolacky, which are a jam-filled cookie traditionally made around the holidays. Colleen was also at the swap demonstrating her unique food storage system, Sweet Stackers, which are trays that you insert into plastic containers in order to fit multiple layers of cookies, bars, candies or other thin items. The food swappers, who are always transporting lots of baked goods, were very interested to hear about Colleen’s product and three swappers won sets of Sweet Stackers to try at home. Thanks so much to Colleen for coming to the Swap! New swapper Lorraine and her husband brought stunning cinnamon rolls and homemade chocolate lollipops in both Hanukkah and Christmas designs. (I am so appreciative when people remember that not everyone celebrates Christmas.) I was very excited to snag some dreidel-shaped pops for my kids. In the category of “I’ve never seen that at the food swap before,” new swapper Breanne brought maple sugar candy floss. Suffice to say, mine disappeared within minutes of my return home. Drinks were popular this time around with new swapper Sarah bringing her cranberry-flavored kombucha and veteran swapper and recipe-tester extraordinaire Gena bringing homemade coffee liqueur. Parents-to-be Tim and Maddy brought their always-popular roasted coffee beans. At least two swappers brought ginger syrup, which is one of my favorite swap items to bring home because I use it to jazz up my sparkling water. There were also plenty of jams, pickles and sauces — always popular swap items. As I mentioned, there will not be a swap in December this year because of the craziness of the holiday season. I do want to take a moment, however, to note that this December marks the third anniversary of the Chicago Food Swap. What an amazing journey it has been! I cannot say enough good things about the people I have met through the swap: their warmth, their openness and, of course, their cooking! It is not an exaggeration to say that founding and running the Chicago Food Swap has changed my life. Huge thanks to my co-founder Vanessa Druckman, all the businesses that have hosted swaps in the past, including the Peterson Garden Project for giving us a permanent home, to our generous sponsors over the years, like Cabot Creamery, Nielsen-Massey Vanillas and Jarlsberg USA, and all the swappers who come and share their food and their enthusiasm. The next swap will take place on January 18 at the Fearless Food Kitchen. Registration for the January swap will open on December 21. Happy holidays to all! Hope to see everyone in 2015.